The wide gulf between wages for men and women is "pure scandal," Pope Francis said on Wednesday. "As Christians, we must become more demanding...[by] supporting with decision the right to equal retribution for equal work; disparity is a pure scandal," he said. The pope was speaking on divorce rates during his weekly general audience in St. Peter's Square, according to Vatican Radio. He said the crisis of "broken marriage bonds" negatively affects young children and called for equal footing in a relationship to carry over into the workplace and society. "The equality enjoyed by the spouses must produce new fruit--equal opportunities in the workplace; a new valuing of motherhood and fatherhood, and a greater appreciation for the openness of families to those most in need,” he said. 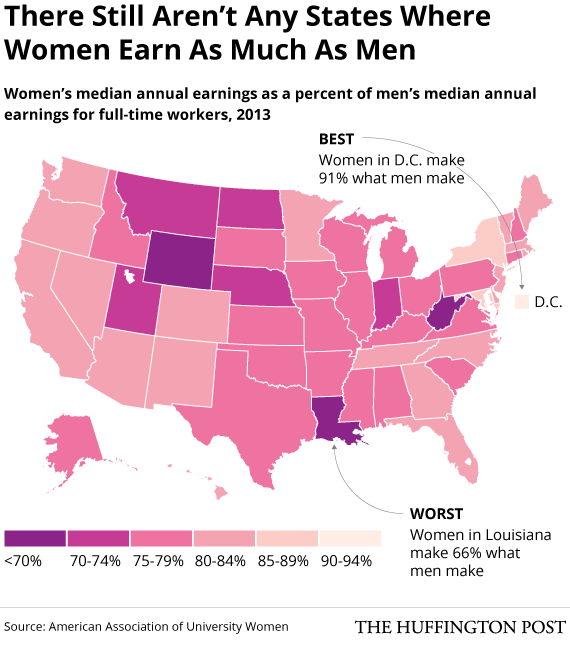 In the U.S., despite ongoing efforts to close the wage gap, there still isn't a single state where women are paid as much as men. On average, women make 78 cents for every dollar earned by a man. Dr. Sakena Yacoobi is the founder of the Afghan Institute of Learning, the Professor Sakena Yacoobi Private Hospital in Herat, and the Professor Sakena Yacoobi Private High Schools in Kabul and Herat, Afghanistan. The Institute provides teacher training, supports education for boys and girls, and delivers health services and education to women and children. She has said: "The Quran tells us to be good, and educations gives you critical thinking skills that are essential for ethical decision-making." Rev. Dr. Katharine Jefferts Schori is the 26th Presiding Bishop of the Episcopal Church. She serves as chief pastor to the Episcopal Church's 1.2 million members across 17 countries and 109 dioceses. Jetsunma Tenzin Palmo is a Tibetan Buddhist nun and founder of the Dongyu Gatsal Ling Nunnery in Himachal Pradesh, India. She was one of the first Westerners to be ordained as a Tibetan Buddhist nun. In 2008, Tenzin Palmo was conferred as Jetsunma (reverend lady) in recognition of her spiritual achievements as a nun and her efforts in promoting the status of female practitioners in Tibetan Buddhism by the head of the Drukpa Lineage. Vashti Murphy McKenzie is a bishop of the African Methodist Episcopal Church. McKenzie is the first female elected as bishop in the denomination's history. In 2005, McKenzie again made history by becoming the first female president of the Council of Bishops of the AME Church, and the Titular head of the AME Church. Diana Eck is a Professor of Comparative Religion at Harvard Divinity school and the Director of the Pluralism Project, a resource that explores and interprets the religious dimensions of America's new immigration. Eck received the National Humanities Award from President Clinton and the National Endowment for the Humanities in 1998. Anat Hoffman Chair of Women of the Wall, whose central mission is to achieve the social and legal recognition of women's rights to wear prayer shawls, pray and read from the Torah collectively and out loud at the Western Wall. She is also is the executive director of the Israel Religious Action Center, the legal and advocacy arm of the Reform Movement in Israel. She formerly held a seat on the Jerusalem City Council, where she stood in opposition to the policies of the city’s right-wing and ultra-Orthodox administration. Rev. Nancy Wilson is the Moderator of the Metropolitan Community Churches. Joan Chittister is the executive director of Benetvision, a resource and research center for contemporary spirituality. She serves as co-chair of the Global Peace Initiative of Women, a partner organization of the UN, facilitating a worldwide network of women peace builders. She was an advisor for the report, A Woman’s Nation, led by Maria Shriver and was a member of the TED prize-sponsored Council of Sages, an interfaith group that developed a Charter for Compassion. Bishop Minerva Carcaño was assigned by the 2012 Western Jurisdictional Conference to be the Resident Bishop in the Los Angeles Episcopal Area. In 2004 she became the first Hispanic woman to be elected to the episcopacy of The United Methodist Church, the second-largest Protestant denomination in the U.S. She is the official spokesperson for the Council of Bishops on the issue of immigration. Sharon Salzberg is a meditation teacher and author. She cofounded the Insight Meditation Society (IMS) in Barre, Massachusetts, and has played a crucial role in bringing Asian meditation practices to the West. The Rev. Dr. Emilie M. Townes is the dean of Vanderbilt Divinity School and a pioneer in the field of womanist theology. Dr. Ingrid Mattson is the London and Windsor Community Chair in Islamic Studies at Huron University College at the University of Western Ontario in London. She founded the Islamic Chaplaincy Program and was the former director of the Macdonald Center for Islamic Studies and Christian-Muslim Relations at Hartford Seminary in Hartford, CT.
Joanna Brooks is the author of The Book of Mormon Girl: A Memoir of an American Faith, a professor of English and comparative literature at San Diego State University and a frequent contributor to Religion Dispatches and other media outlets. She is a leading voice on Mormon life and politics. Rev. Sally Bingham is the Founder and President of Interfaith Power & Light, an organization that does faith-based environmental advocacy. In 2014 she was appointed to the White House panel on Environmental Stewardship & Climate Change. She serves as Canon for the Environment in the Episcopal Diocese of California. Margot Adler is an NPR correspondent, Wiccan priestess and author of Drawing Down the Moon, sociological study of contemporary Paganism in the United States. She joined the NPR staff in 1979 and has contributed regularly to All Things Considered, Morning Edition and Weekend Edition. She is considered to be a leading voice in the neopagan community. Fahima Hashim is the Director for Salmmah Women’s Resource Center. She has spent over 25 years working in the area of gender and development, and with a special emphasis on women’s rights and sexuality, violence against women, and peace working with female youth in conflict areas. Rabbi Sharon Kleinbaum is the spiritual leader of Congregation Beit Simchat Torah (CBST) also known as the LGBT synagogue, and is regarded as one of the most important rabbis in America. Prior to joining CBST, Rabbi Kleinbaum was Director of Congregational Relations at the Religious Action Center of Reform Judaism in Washington, DC, from 1990-92. Jetsün Khandro Rinpoche is one of the very few fully trained female Rinpoches ("precious masters") in the Tibetan tradition. She was recognized by His Holiness the 16th Gyalwang Karmapa as the reincarnation of the great Dakini of Tshurphu, Khandro Orgyen Tsomo and a respected and revered female master. For the past two decades, Jetsün Khandro Rinpoche has taughter in Europe, North America, and Asia. Malala Yousufzai was shot by the Taliban for standing up for the education of girls and has electrified the world with her determination and courage in the face of ignorance and hate. Amrit Singh is the senior legal officer for national security and counterterrorism for the Open Society Justice Initiative. She served as a staff attorney at the ACLU Immigrants’ Rights Project and was one of the fiercest U.S. critics of the torture and abuse of prisoners under the Bush Administration. Her father is the 13th and current Prime Minister of India, Manmohan Singh, the first Sikh to hold this office. Rachel Held Evans is a Christian columnist, blogger and author of Evolving in Monkey Town and A Year of Biblical Womanhood. Best known for her blog, Evans has been named one of Christianity Today's "50 Women to Watch. " Joyce Meyer is one of the world's leading practical Bible teachers. Through Joyce Meyer Ministries, she teaches on a number of topics with a particular focus on the mind, moods and attitudes. Joyce hosts a TV and radio show, Enjoying Everyday Life®, which broadcasts worldwide to a potential audience of 4.5 billion people. Rev. Dr. Sharon E. Watkins is the General Minister and President of the Christian Church (Disciples of Christ) in the United States and Canada. She is general pastor of the 700,000-member denomination, responsible for representing the wholeness of the church, for reconciling differences, and for helping the church retain its clarity of mission and identity. Dorothy Nelson is a United States Federal Judge, nominated by Jimmy Carter in 1979. She was the first woman law professor at the University of Southern California and was later named its Dean in 1969, becoming the first woman dean of a major American law school. She is the longest-standing member of the U.S. Baha’i community. Layli Miller-Muro is a prominent voice in the Baha'i community and the Founder and Executive Director of the Tahirih Justice Center, a non-profit organization that works to protect women and girls from human rights abuses through legal aid and public policy advocacy. Before that she worked as an attorney at Arnold & Porter and an attorney-advisor at the U.S. Department of Justice, Board of Immigration Appeals. Archbishop Antje Jackelen Is Sweden's First Female Archbishop. Daisy Khan is Executive Director of the American Society for Muslim Advancement (ASMA), a New York-based non-profit that works to build bridges between Muslims and the general public. She has launched two flagship programs: the Muslim Leaders of Tomorrow (MLT) and Women's Islamic Initiative in Spirituality and Equality (WISE), global movements to empower Muslim youth and women. Ruth W. Messinger is the President of American Jewish World Service (AJWS), an international development organization providing support to more than 200 grassroots social change projects in Africa, Asia, and the Americas. Prior to assuming her position at AJWS in 1998, Ms. Messinger was in public service in New York City for 20 years. She served 12 years in the New York City Council and eight years as Manhattan borough president. In 2003, Shirin became the first Muslim woman to receive the Nobel Peace Prize. She was the first woman to achieve Chief Justice status in Iran but was dismissed from this position after the 1979 Revolution. Ebadi opened a legal practice and began defending people who were persecuted by the government, working particularly toward the rights of women and children. Lisa Sharon Harper is the senior director of mobilizing for Sojourners. She was the founding executive director of New York Faith & Justice—an organization at the hub of a new ecumenical movement to end poverty in New York City. She helped establish Faith Leaders for Environmental Justice and also organized faith leaders to speak out for immigration reform and organized the South Bronx Conversations for Change. Dr. Wadud is a professor of Islamic studies at Virginia Commonwealth University and author of Qur'an and Woman: Rereading the Sacred Text from a Woman's Perspective. In 2005, she made waves in the Islamic world by being the first female imam to lead a mixed-congregation prayer. Liza Levy is the vice president for Financial Resource Development at the Jewish Federation of Greater Washington. Liza was the co-founder of both the Tikkun Olam Women’s Foundation and Jewish Coalition Against Domestic Abuse, where she was the recipient of the Barbara Rabkin Eshet Chayil Award. She also received the Jewish Federation of North America’s 2012 Kipnis/Wilson Friedland award for women demonstrating leadership, philanthropy and volunteerism. Starhawk is an author, activist and leading voice in the American neopagan community. She is a cofounder of Reclaiming, an activist branch of modern pagan religion. Her book, The Spiral Dance, is considered to be an essential text for the neopagan movement, and she regularly leads permaculture and earth activism trainings. A former nun, Karen Armstrong is a religious scholar and author of more than 20 books on faith and world religions. In 2008 she received the TED Prize and asked for help create, launch, and propagate the Charter for Compassion. Nadia Bolz-Weber is the founding pastor of House for All Sinners and Saints, an ELCA mission church in Denver, Colorado. She’s a leading voice in the emerging church movement and her writing can be found in The Christian Century and Jim Wallis’ God’s Politics blog. Sara Miles is the founder and director of The Food Pantry and serves as Director of Ministry at St. Gregory of Nyssa Episcopal Church in San Francisco. She is the author of Jesus Freak: Feeding Healing Raising the Dead and Take This Bread: A Radical Conversion. She speaks, preaches and leads workshops around the country, and her writing has appeared in the New York Times Magazine, the New Yorker, The Huffington Post and on National Public Radio. Linda K. Burton is the 16th general president of the Relief Society of The Church of Jesus Christ of Latter-day Saints. She previously worked as an LDS seminary teacher and has become a prominent female voice in the LDS community. Dr. Nahid Angha is the co-founder and co-director of the International Association of Sufism. She is the main representative of IAS to the United Nations (NGO/DPI) and the first Muslim woman inducted to the Marin Women’s Hall of Fame. She also serves as Executive Editor of the journal Sufism, An Inquiry, and founder of the international Sufi Women Organization (SWO). Rev. Elizabeth A. Eaton is the fourth presiding bishop of the Evangelical Lutheran Church in American, and the denomination's first female presiding bishop. She previously served as the bishop of the ELCA Northeastern Ohio Synod and is a board member of Trinity Lutheran Seminary and Capital University. Barbara Brown Taylor is the Butman Professor of Religion at Piedmont College in Georgia. An Episcopal priest since 1984, she is the author of multiple books, including the New York Times bestseller An Altar in the World. She has lectured and preached around the country and is considered to be a leading voice in the Episcopal community. Pema Chödrön became a novice nun in her mid 40s and received the full monastic ordination in the Chinese lineage of Buddhism in 1981 in Hong Kong. She served as the director of Karma Dzong in Colorado and Gampo Abbey in Nova Scotia. She currently teaches in the United States and Canada with the aim of further developing the monastic tradition in the West. Chung Hyun Kyung is a theologian and professor at Union Theological Seminary. Her research interests include feminist and eco-feminist theologies and spiritualities from Asia, Africa and Latin America; Christian-Buddhist dialogue. Christine Caine is an Australian pastor and Evangelical speaker. With her husband, Caine founded The A21 Campaign, a non-profit organization that combats human trafficking, as well asEquip & Empower Ministries. Mata Amritanandamayi, known throughout the world as Amma the hugging saint, runs Embracing the World®, a global network of charitable organizations and project. She has embraced and comforted more than 32 million people and is considered to be one of India’s foremost spiritual leaders. Julie Schonfeld is the Executive Vice President of the Rabbinical Assembly and is first female rabbi to serve in the chief executive position of an American rabbinical association. Sister Carol Keehan is the ninth president and chief executive officer of the Catholic Health Association of the United States (CHA). Sister Carol has worked in administrative and governance positions at hospitals sponsored by the Daughters of Charity for more than 35 years. She is a representative to the International Federal of Catholic Health Care Associations (AISAC) of the Pontifical Council for Pastoral Health Care and serves on the board of Catholic Relief Services, Baltimore.